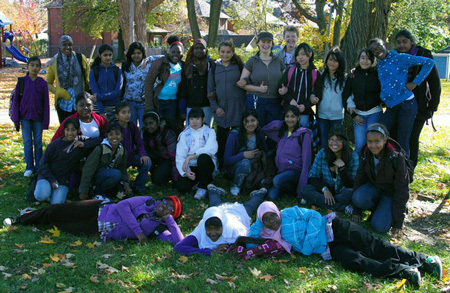 As an educator, gardener and artist Jane Hayes has long been involved in establishing children's garden programs and numerous school food gardens throughout Toronto. In 2007 she founded Garden Jane, a community-minded business providing garden education through a variety of workshops, activities, talks and demonstrations. She also created Cirque D'irt, a high-spirited enterprise that combines performance, music, community and environmental education. Soiled and Seeded recently spoke to Jane Hayes about gardens, kids, stories and soils. 1. What are the impacts, or direct benefits of giving children a gardening education? Sunlight and fresh air, along with wind, rain, soil and garden life, are stimulating to kids brains and improves their learning. People who work with kids in gardens have observed that gardening can help children find a sense of purpose, become calmer and enjoy healthy food more often. They can develop a deeper respect for life, as well as trust, by being around and caring for other living things. Their garden experiences are often transformative, even if very brief. For example, school kids will talk about a short garden field trip experience for months afterwards according to teachers and parents. The scientific research on benefits hasn't caught up to the anecdotal reports. However, there is a Canadian study that observed that green school grounds (and gardens) "appeal to a wider variety of student interests and support a wider variety of play opportunities that promote more vigorous, moderate and light physical activity." Quality of play goes up and more girls engage in activity. Other studies are starting to show that kids who grow their own vegetables are more likely to eat them. One of my favourite studies reports that touching a common soil bacterium boosts serotonin levels in the brain, which helps explain the sense of well being we see in both kids and adults. 2. Many of the workshops you offer combine story, performance arts and gardening. In addition to Cirque Dirt, you offer a unique narrative through Toronto's Gardiner Museum - a tour describing the history of food and gardening through clay and ceramic arts. What role does story and performance play in your programs? Stories help me express the idea that we're all learning, we all hold different pieces of truth, and there isn't an infallible expert with the answers. I think people are often caught up in gardening the right way and that can be a mental block to gardening. One of my Cirque Dirt characters is Garden Jane, a spoof of me as expert community organizer and gardener. My character gets caught up in the world of her own ideas at the expense of the garden. Her redeeming quality is genuinely seeking to learn how to garden and connect – she eventually gets over herself and gets down to understanding what the earth is already doing quite well on its own. Story characters can go through transformations and say things that are beyond conventional advice and perceived truth. It doesn't matter if they're wrong, but when they're right you sense it in your body. That body experience offers you information that is truly yours and is therefore memorable. Stories help me introduce theories, activities and questions in a way that appeals to multiple audiences too. Ideally a story can reach a 6 year old and a farmer at the same time and both take something away. One of my favourite stories is about Masanobu Fukuoka, an inspiring Japanese farmer who invented seed balls as a way to distribute seeds over land with much less work than traditional planting. I embellish history with a fictional story in which he is a terrible juggler who wants to join the circus. He makes seed balls so he can practice juggling with them. He considers his crop planted as he drops the balls - and has great results. Kids can relate to the story logic and farmers can relate to a good idea while having a chuckle. Better yet, when we make seedballs while telling the story. 3. For adult gardeners, whether the novice or enthusiast, it is easy to be seduced by the flowers and the foliage. Gardening how-to books offer intoxicating garden spaces with a token chapter on soil. Can you explain why your classes focus heavily on the science of soil? Backyards are our local outer space. We know so little about the world under our feet. Soils are like oceans. So much life. So much going on. The billions of microorganisms and many thousands of species in small amounts of soil are likely to remain unknown for the forseeable future. I give soils a lot of attention because they are both mysterious and the foundation of everything else in a garden. I aim to help people understand the principles and politics behind the garden advice they've heard and to understand the natural laws that govern soils. I share permaculture principles to help people in their practice of working with soils. Through workshops, people have a chance to observe and experience soils with their hands and hearts. I encourage people to keep soil alive through practices that we know work - mulching, composting, covering soil - and a few less conventional ideas, like keeping dynamic accumulators (weeds), in your garden. People really enjoy the topic and they often get excited about learning more through their own practices and talking with others. 4. You recently presented a 500 year plan as part of the book, Hope Beneath Our Feet: Restoring Our Place in the Natural World. Can you tell us what the plan entails? The idea is inspired by seventh generation planning used in some First Nations decision-making models (i.e. is what we are doing or planning to do good for the great grandchildren of our great grandchildren?). Excellent long term environmental planning documents can cover 100 years. I'd like to see the range of what is considered in social and environmental planning to be extended past budget and political cycles. I imagine creating and beginning to implement a 500-year plan over the next few decades with as many creative people as I can find. We have some practical programs to kick start it. The first is a seed saving program for kids called the Bean Keepers. Kids are invited to care for one of the 4000 varieties of beans that grow in Canada (28,000 world-wide) that no-one else is seeming to care for. So far we're five years in and have engaged a few thousand kids along with a few dozen schools, community groups and garden education programs. Seeds of Diversity and Evergreen are helping to make it national. We have started to engage a few farmers and have a few bean varieties being saved. There's lots more work to do, so if anyone wants to join me on this, please drop me a line. The Potato Project is still under development and has had some schools join in to grow and learn about potatoes. I'm playing with a mycellial magic program too, with the hopes of awakening barren soils with the help of kids and youth. Cirque Dirt's stage show and community is growing too so we have a playful way to communicate and show people what we're learning. I think we need more wildness, more diversity, more creative thinking and practices. We learn so much when we play, so we'll be served by more of the right kinds of play opportunities. Imagine gardens in walking (riding, rolling) distance of every child. How about kids learning how to build an inch of soil over the course of their lives? I'd like my generation and our children's to leave behind soil middens like the Terra Preta in the Amazon. And while we're at it, let's encourage healthy soil corridors between cities with rural places to support the ravine systems we already have. The bottom line is to figure out how to live in better balance between fun, responsibility, health and with the earth in mind. I think it'll be fun. 5. What's in store for Garden Jane for the coming season? What have you got planned? We are starting with a soils discussion group with farm field trips. There are Introduction to Organic Gardening and Permaculture workshops. We're working with the York Region Food Network and Transition York Region to introduce permaculture there. Cirque Dirt will have a tent at Harboufront for the May long weekend and, hopefully we'll also be on stage for Thanksgiving weekend. We've got all ages worm composting workshops happening. We're continuing to develop a few series' including Health Promotion Garden (and Farm) Tours and Herb Identification, Preserving and Processing Classes. We'll likely do a few farmer's market programs too and I hope to run a Personal Permaculture discussion group next fall. My nine-month-old daughter Chloe is inspiring me to think about running a baby/toddler gardening workshop at some point. We have a few more surprises in store for people too. You can check out our website for more info at www.gardenjane.com or Facebook. We send out a newsletter once a month, which you can sign up for online. Better yet, come out and do something fun with us.